It already seems so long ago that I was enjoying the flamenco in Jerez. This is, in part, because of the apparent dislocation in time when travelling from one country and one home to another, but it’s also because so much has happened since I returned to London – the publication of ‘Reconquista‘, the work on the Clapham LitFest, launch support activity, etc.. Oh, and the Easter break. One of the things in Jerez that I decided I would blog about, once the flamenco was over, was its excellent Archeological Museum. Yet again I visited this museum when I was there, taking some friends who hadn’t seen it before and yet again I enjoyed looking at the permanent collection. For many years it was ‘closed for refurbishment’ until I simply stopped looking to see if it was open. But it has opened again and it has been refurbished very well. 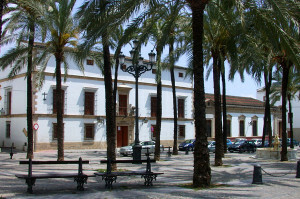 Situated in the Plaza Mercado, the old Arab market place of the city, ( a name which readers of ‘Reconquista‘ will recognise ) the museum occupies a late 18th century building, which was formerly an educational institution. Not as big as other museums which have appeared on The Story Bazaar blog, it is, nonetheless, well worth a visit. It stretches over three floors around a central patio and includes exhibits from pre-history up to and including the twentieth century. It also includes excavations within the grounds of the Museum itself, a perfect and very immediate example of the remains of the different eras that lie beneath the city. 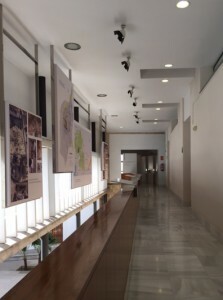 There is a lift for those who cannot manage stairs and English versions of the interactive presentations, although the exhibits are annotated in Spanish ( they are not difficult to understand ). The pre-history sections are very interesting, showing the parallel development of homo sapiens neanderthalensis and homo sapiens sapiens. Members of both crossed the land bridge from Africa to what is now the tip of southern Spain during pre-history. Indeed the area is rich in cave paintings and other early examples of socialised humanoids. A skeleton found near Gibraltar is, it is claimed, even earlier than those found in the Neander valley. So perhaps neanderthalensis should actually be andalusiensis? 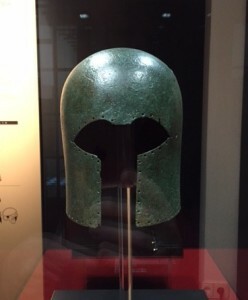 One of its most famous exhibits is the very early Phoenician helmet ( left) found in mud near the River Guadelete. Even back in London an archeology-loving acquaintance knew all about it. It’s a fine piece, but they must have had small heads. There are lots of Roman exhibits, from Hasta Regia, the Roman town nearby, but the highlights for me were the Moorish exhibits, set out as if in a Xeres house of the 9th/1oth century. This is what a northern European visitor finds so unusual (especially one who used to live in Rome). There is an interesting virtual reality film of the Alcazar or castle as it was during the Moorish period, something which enhances one’s understanding of it – the Alcazar is open to the public. What happened after the re-conquest of Jerez by Alfonso X and the Christians is covered in some detail too, with some very fine examples of trade goods from across Europe, which show how prosperous and well-connected Jerez was. The artefacts from Britain are all to do with the sherry trade, which, while it didn’t start in industrial-style proportions until later, was already going during the 1500s. Even Sir Francis Drake, it is claimed, was a partner in a sherry enterprise, but it didn’t go well, apparently, thus giving him encouragement, if any was needed, to launch his later attack on Cadiz. 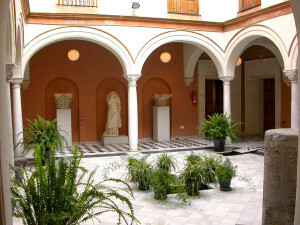 The Museum is open from 10.00a.m. to 12.00p.m. ad from 4.oop.m. to 7.00p.m. Tuesday to Friday and in the mornings at weekends. See web-site for details. It costs 5 euros to enter ( 1.80 concessions ). It is free to the public on the first Sunday morning in every month. This entry was posted in From a Foreign Field, History and tagged Foreign field, History, Worth a visit by juliej. Bookmark the permalink.